The Flowrox Geobag, an all-in-one geotextile filtration and dewatering unit. Finnish valve and pump manufacturer, Flowrox, has released its Flowrox Geobag, an all-in-one geotextile filtration and dewatering unit. The Flowrox GeoBag is specifically designed for dewatering of waste and process sludges and filtration of water with high solids content. For example, sewage sludge dewatering, tailings dewatering, concentration of oily sludge, filtration and dewatering of precipitated solids and impurities, filtration and dewatering of clay, sand, and other fine particles. It enables cost-efficient transportation of solids or concentrated sludge. The unit is based on sludge or water with flocculated solids being pumped into a geotextile bag that effectively retains the solid fraction while allowing water to pass through. A water-tight floor construction with a drain valve enables closed and clean filtration and dewatering processes. The Flowrox Geobag consists of Flowrox’s Packaged Pumping System and its LPP-T (transfer pump) to ensure its chemical dosing ability and a high level of pumping. 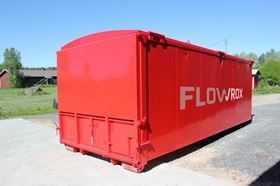 The unit is compatible with Flowrox Smart Solutions and includes a container and geotextile bag, a high-performance slurry pump, chemical dosing pumps, and a flocculation reactor module. For cold climates the unit can be insulated and heated.